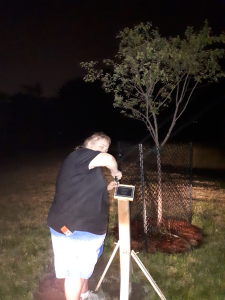 Late night installing the post with the plaque. The grade six class picked out a paragraph from Dr.Seuss. One of our plans for the TreeGeneration is to start Graduation Way. Every year, we will meet with the grade sixes and present a choice of 3 trees that are compatible with the soil condition along the new pathway and they will talk about, debate and vote on the tree they want to represent their graduating class. 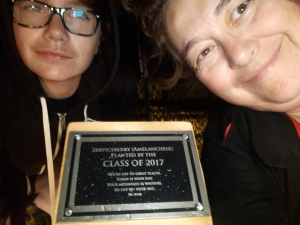 Ideally we would normally start this process in the fall, plant the tree, have the students as part of all steps including caring for the tree and then in June there would be a ceremony dedicating that tree as their “Graduation Tree”. A memory that will live on far into the future and hopefully foster a stewardship for nature. This year, since we are starting late, we will speed up the process but there will be a “Graduation Tree”.